Immune Boost is a perfectly balanced synergy blend of pure and essential oils reputed as being some of the best for invigorating the immune system including Tea Tree, Eucalyptus, Lemon, Orange, Rosemary and Sandalwood. This innovative multi-tasker functions as an all over body moisturizer, luxurious hair and scalp treatment, nourishing bath oil and instant sensory remedy! Naturally active aromatherapy essential oil blend combines with delicate skin nourishing seed oils to create IMMUNE BOOST Multi-Nutritive Oil for Body, Bath and Hair. 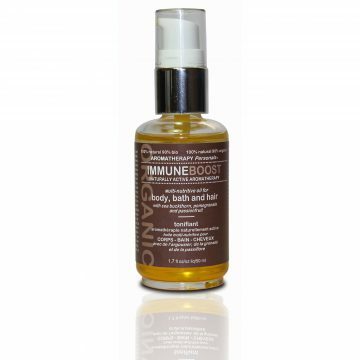 Immune Boost's multi-nutrient enriched oil blend of Pomegranate, Passionfruit and Sea Buckthorn seed oils help smooth, hydrate and protect skin and hair with anti-oxidant vitamins A, B, C + E and delivers an unsurpassed source of omegas-3, 6, + 9 for soft, luminous skin and hair. Rare omega-7 fatty acid helps boost collagen production and creates the perfect barrier to moisturize, rejuvenate, repair and protect. 100-percent all natural sensory-skin remedy. Immune Boost offers a modern solution to an ancient approach to renewal and well-being. Conditioning Scalp Treatment: Add a small amount to scalp one hour prior to washing hair. Rinse well with warm water and shampoo.